Book: Double Bind – First Glance, but mostly about me and how it’s not about me. First, before I tell you about this cool, new book, I’ll give you a snapshot of my life as I see it pertaining to the book’s subject. This list of books is great for the 2nd to 5th grade level readers. Can’t wait to dig in with my daughter. If you develop WordPress templates and you aren’t using this plug-in, stop what you’re doing and go grab it. It’s a simple plugin that displays the current template you are in in the upper right-hand corner of your admin bar. So easy, so useful. I found this great WordPress guide on installing a local development environment using brew and npm for wordpress, php and mysql. With the db running through brew services. Loving it. Install was fairly easy, with a little bit of troubleshooting (why oh why did I not document the troubleshooting part!). I cannot for the life of me remember how to create a new db, the instructions in the quick start aren’t working for me. This post shows a much better method for creating new databases once you’ve gotten everything else running from the quick start guide above. The test data/subject matter of all these programming courses I’ve been taking is always either dungeons and dragons or games or robots, seriously. Where are the programming classes that use glitter or barbie as test data/subjects. What about cleaning products, vacuum cleaners, diaper brands, laundry detergents. No wonder men are so reluctant to share home duties. They are always thinking about dragons and robots. I’m kidding here. 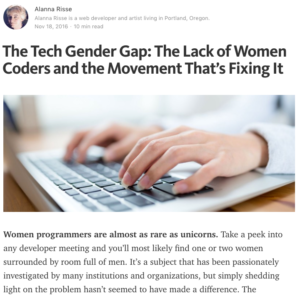 I would like to see some less gender stereotyped content in these things though. I always have to look up how to do this. Dreamhost made some great, clear instructions. I’m impressed with this very in-depth article about ading custom fonts. If you are looking for a specific answer, it’s easy enough to scroll down and find what you are looking for, but if you want a full primer, this has lots of great info. Don’t Panic! Do. Not. Panic. Remain Calm. What was I saying? Troubleshooting, right. I have to continuously remind myself that I have the skills to figure out any problem I encounter. Last week it was completely uninstalling mySql from my Mac. Not as easy as it sounds, I first had to figure out that the problem I was having had to do with machine migration and how mySql doesn’t like to do this. Am I digressing again? Maybe I’m postgressing? Maybe I should have been postgressing. Working from home makes you kinda loopy. Yesterday I broke one of my dev environments. I really broke it good. And I was kind of afraid I’d have to rebuild the whole environment from scratch. I have an itchy trigger finger and if things aren’t working, I’m liable to just chuck it and start over. This time, my friends, I kept my cool. I just sat on it for a while. I thought about all the ways it was broken, and I had a lightbulb moment where I figured out how to fix it. See? I got this. Easy peezy. I really need to remember that I have the skills to do this. My ego has been messing with me something fierce. 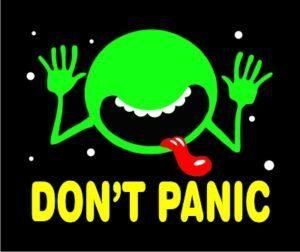 I think it’s time to put the “Don’t Panic” sign up behind my desk. Deep breath, go do a head stand. put the code down and go hug your child. The code isn’t going to get more broken if you ignore it for a day. Start React (A product of GeekyAnts) has a few starter templates for React and React Native.